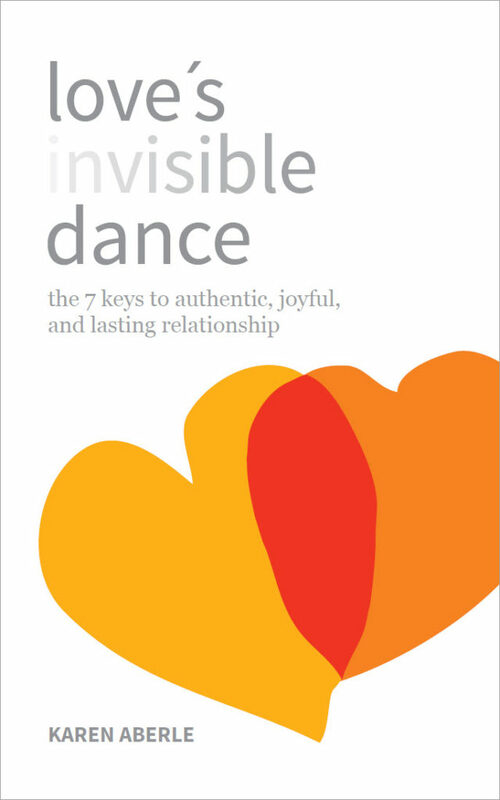 In this transformational book, Love’s Invisible Dance, the 7 keys to authentic, joyful, and lasting relationship, Karen Aberle shows us what we have never seen before – that love is a way that we dance in our relationship with others. It is an actual dance that we’ve been doing all our lives, unconsciously. It is the way we interact with everything and everyone we encounter, including ourselves. Once you see the dance, you can’t unsee it. And seeing it changes everything. It is a book for anyone who suffers from not enough love in their life and is mature enough to take responsibility for creating more. Learning how to perform the moves of the dance effectively increases our ability to live gracefully, in loving harmony, with our colleagues, family, friends, and neighbors, and co-create our dreams in partnership. Are you courageous enough to take Love’s Invisible Dance Competency Quiz? This radically new discourse about love is born of the marriage of the philosophy of language and indigenous shamanic practice. Karen and her husband of 30 years have defined the choreography of the dance. Their story is an enlightening and entertaining backdrop for the book. They have taught the dance of relationship to thousands of people in corporate programs to Fortune 500 firms such as Comcast, Pfizer, Charter Communications, Omnicom, and in community workshops all over the world. She is a frequent guest on relationship talk radio. On a scale of 1-10, 10 being perfectly satisfied with your life, how satisfied are you? People cheat because they don’t know how to tell the difficult truth. If you look in the mirror and don’t see your attractiveness, you’re looking in the wrong mirror. Do you want to be loved for who you truly are, or who you pretend to be? A graceful dance is a dance with honor - accepting others exactly as they are. "In this marvelously insightful, beautifully written book karen aberle addresses one of the central issues of our time: the constant struggle, especially for women, to develop a fully satisfying life for themselves in a loving relationship with another." "This book cradles a gift; a treasure that will enrich the wholeness of your life. Relationships you thought were lost, can be found. Bridges that need to be built can be erected. But it all starts with the dance. Karen's wisdom and principles will change your life, i know this to be true." "Karen aberle has given us a simple yet extraordinary way to see ourselves in the dance of life. She’s a world-class performer and teacher whose openness and humanity, distinctions and practices inspire appreciation for all of our failures and an eagerness to give love another chance at greatness." "In some cultures, the poet is considered a shaman; karen aberle is poet, shaman, and teacher who invests us with a way of thinking, deepens our language tools, and helps us overcome life-long habits of thought and action that stand in the way of relationship, leadership and creative collaboration." "Karen offers an approach to the mystery of love and relatedness, that in its very practicality moves one toward the truth and honesty that is crucial to crossing the threshold to the experience of the heart, where the song of the world can be heard."